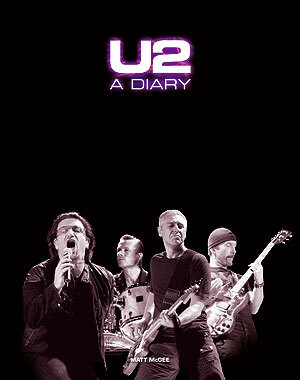 First published in 2008, U2 – A Diary presents the complete history of U2 — from 1950s Dublin when Bono’s parents were married, to the birth of the band, through the band’s rise to fame in the 1980s, and all the way to the present — told as it happened in an easy-to-use diary format. Prior to this book, there was no single, comprehensive resource that details all the relevant day-to-day history that has shaped U2 into the band it is today. But U2 – A Diary is more than just a timeline of dates and facts. It provides the important stories behind the “who, what, when, and where,” including stories and insights about key moments in U2’s development that have never been told before. In the spring of 2005 I was pitching a different book idea to various publishers, including Omnibus Press (part of Music Sales Group). Omnibus wasn’t interested in the book idea I was pitching, but instead approached me to write U2 – A Diary. After some initial discussions about the idea, we began negotiating a contract. I hired an agent to handle the business stuff while I began writing the book. For a variety of reasons, the project sat on the back burner and no publishing agreement was reached until Spring 2007. The original manuscript was turned in on January 2, 2008, and the first edition was published in October 2008. Since that time, I’ve continued to track U2’s comings and goings in timeline/diary-style entries. In October, 2010, Omnibus Press asked me to update the book with the goal of publishing a second edition in mid-2011. My name is Matt McGee. I’ve been listening to U2 since hearing “I Will Follow” on a Philadelphia radio station in 1981. I stopped dating other bands in 1983 when I heard “New Year’s Day.” In 1995, I founded @U2 (www.atu2.com), which is now the oldest independent site for U2 fans on the Web. @U2 has been invited to co-host events at the Rock and Roll Hall of Fame in Cleveland, and has earned numerous awards over its long history. In December, 2007, Entertainment Weekly included @U2 at #4 on its list of the 25 Best Fan Web Sites covering music, movies, or television. @U2 was the highest music fan site to be listed. I’ll be researching, writing, and using this blog to keep interested U2 fans updated about U2 – A Diary. I’ll also be asking for your help in making the second edition of the book the best it can be. This is a project I’m passionate about and love working on. I’m fascinated by U2’s history and love researching and writing about this aspect of my favorite band.